On this day, in the year 1099, the armies of the First Crusade (1096-1099) reached the walls of the city of Jerusalem. What began as one Byzantine Emperor’s cry for help as his dominion was threatened by the Selijuk Turks sparked military conflict between Western European states united under the banner of the Holy Catholic Church and Muslims in the Levant that would not see an end until the close of the 17th century. As a response to Byzantine Emperor Alexius I’s plea for military support in 1095, Pope Urban II issued an edict at the Council of Clemont the next year that called for Christians everywhere to unite in a war against the Turks. Additionally, as if his papal authority were not enough to draw legions of soldiers to the cause, the Pope also promised that the immediate remission of sins would be granted to any who lost their life in this holy endeavor. On August 15, 1096, the motivated band of Church-sanctioned soldiers now called the crusader armies set off from France and Italy. With a pledge to restore lost cities and lands to the empire, the armies quickly made their way eastward by land through the capital city of Constantinople and on south through Anatolia. 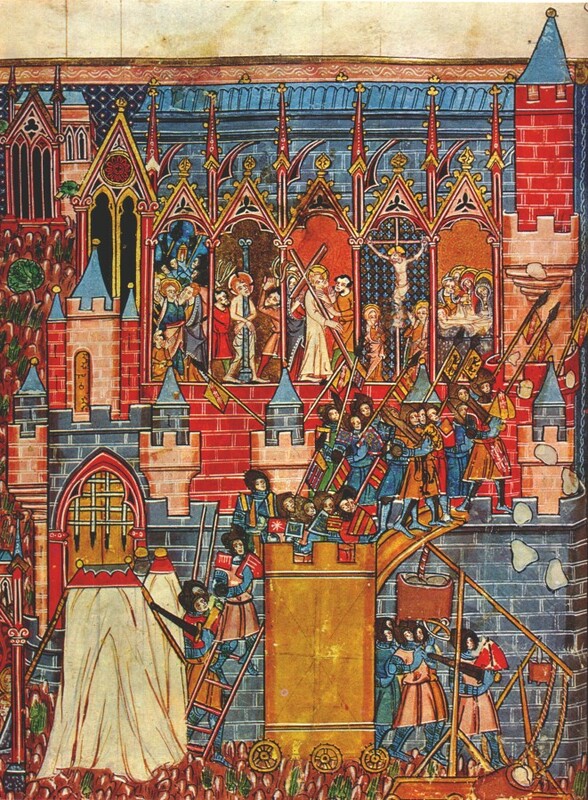 After capturing a number of weaker territories along the way, the crusaders saw their first major victory when, on June 3, 1098, they sacked the city of Antioch. As for standard military philosophy when an enemy force refused to surrender a besieged city, the baron-led armies of knights left no mercy for Antioch, pillaging and destroying the city while massacring as many of its inhabitants as possible along the way. Strengthened by this victory, the armies then marched on toward the holy city of Jerusalem.